Options for dining around the National Archeological Museum can be pretty limited unless you’re looking for a souvlaki or tiropita, so when an Athenian friend took us to Alexandria Restaurant the other night, I went in hopes that I’d find a place something worth sharing. Alexandria, a Greek-Egyptian restaurant, occupies the first floor of a beautifully restored Neo-Classical building on a side street near, interestingly enough, Platiea Aigyptou, otherwise known in English as Egypt Square. I’m not sure if chef-owner Pantelis Papachristou and his wife, Cleopatra (really, that IS her name!) chose this spot for it’s proximity to the appropriately name square, but I’m pleased to have found a new gem in the rough and tumble National Archeological Museum of Athens area that’s open for lunch and for dinner (except Sundays, they are closed). Since the garden wasn’t open the night we visited, we opted for the smaller of the two parlors on the main floor of the house. It was a bit quieter on a busy Saturday night, and since they’ve just moved back inside as “winter” starts here in Athens, they haven’t designated their non-smoking area yet. In the weeks to come the parlor we chose will become the smoking area, while the larger parlor will be the completely separate (hooray!) non smoking area. Incidentally, no one ever smoked in the smaller parlor where we sat. And our dinner lasted several hours. Perhaps a sign of changes slowly coming to Athens. We didn’t have to wait long at our table to be presented with a meze of spicy red pepper tampenade, reminiscent of Muhammara, slightly sweet, slightly spicy and at once smooth and crunchy dip served throughout the Middle East. We nibbled at it as we worked up an appetite just reading the menu. Although the menu wasn’t huge, there were some daily special additions, and frankly, with so many interesting sounding items we finally closed our menus and suggested that our Athenian friend, who eats here often, order. 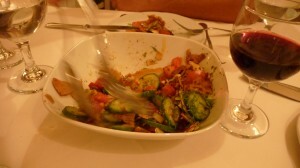 We were a party of 3, and he chose a mix of 3 items from the appetizer menu, a salad and two main plates, all to share. Our Fatoush salad was totally different from any Fatoush I’ve eaten before. It was a chunky mix of tomatoes, cucumbers, parsley and herbs and spices, perhaps a knock-off on the traditional Greek “cucumber-tomato” salad, in a lovely vinegerette dressing, with crispy pieces of pita chips generously tossed in. It seems that beet salads are becoming very popular on Athenian menus these days, and each chef has their own interpretation. 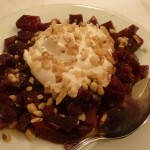 Pantelis’ salad was a simple presentation of diced fresh beets, topped with a yogurt dressing a sprinkled with walnuts. The nuts made a nice contrast with the tender beets. The onion and feta pita, layered top and bottom in filo, and cooked to perfection, sliced easily without falling apart for us to share. 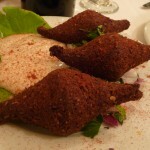 Three perfect koubeba, which I’ve known as “kibbe”, were fried to a tender crisp and these bulgar fritters stuffed with meat, herbs and spices held a pleasant surprise with the addition of currants and pine nuts inside. The tahini served along with the koubeba had a slightly aromatic flavor, which Cleopatra told me comes from the addition of coriander. The lamb, served with dried nuts and fruit, surprised us all. It was moist and tender, and the fruits, which we thought might make the dish overwhelmingly sweet, actually adding texture without the sweetness we dislike in make course fruit laden dishes. 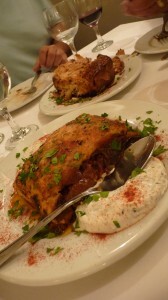 But the most magical example of chef Pantelis’ skill was the baked eggplant with yogurt bechamel. Reminiscent of the more traditional Greek moussaka, this Egyptian adaptation is baked with a layer of yogurt bechemal, giving it a hint of flavor not found in the typical rich bechemal sauce, and perhaps this is what contributes to the lightness of what is typically a “heavy” topping on moussaka. Did I mention dessert? Stuffed as we all were, we opted to split one dessert. Our brains must have been full, too, since none of us can remember what it was called, although we definately all remember how it tasted … Served in a traditional baking dish, we assumed it would be some sort of a flan or creme caramel type sweet. None of us were prepared for the warm creamy sauce we discovered, as as we dug down further we found a crispy base, sweet and crunchy with hints of sweet dried fruits and nuts. Save room for this. Our food portion of the bill came in at just under 22 euro/person. Dinner for the three of us, with the bottle of wine, was 88 euro, although quite honestly we all agreed we had ordered way too much food, and that we could have easily fed a fourth person and still all be quite satisfied. 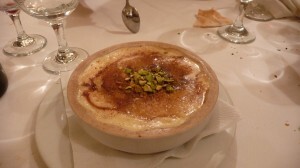 I’ll be returning to Alexandria Restaurant, next time for lunch. In a city filled with “over the top” presentations and oftentimes bizzare “fusions”, this is a simple, slightly upscale, dining option which offers well prepared food, with friendly service, in a lovely setting. And yes, while it isn’t the cheapest option around, I think that in contrast to restaurants in a similar price range, this place ranks at the top of my list. My only disappointment is that they don’t offer an option of a good house wine. Reservations recommended for dinner, the owner’s speak English and menus are available in English. 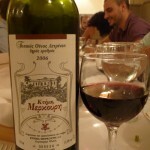 To reach the restaurant from the National Archeological Museum, turn right on 28th October (Oktovriou) Street, also called Patission and walk 1 block to Metsovou, turn right again and walk 2 short blocks to the corner of Metsovou and Rethymnon. It’s on the left side of the street on the corner in the restored Neo-classical building. If you aren’t coming from the Museum, the number 2 and 11 trolleys will let you off on Patission near the Museum, or you can take the Metro to Victoria Square.